Winter can be a challenging season to get through. Between the cold temperatures, the dark days and the overall gloomy atmosphere, it’s easy to see why this time of year can have such a direct impact on our mood. We’re all eagerly awaiting the arrival of spring, when things will finally begin to get lighter, brighter, warmer and more welcoming. But why wait for spring to come to you? Using the power of interior design, you can banish the winter blues once and for all by turning your home into a sunlit sanctuary. Decorating your home in certain colours, styles and furnishings can help to boost the look and feel of your interiors, making you feel more positive in the process. With that in mind, here are our best tips for heating up your home this winter. Mirrored and metallic surfaces are a truly modern way to lift the mood of a room, especially when combined with some unique or interesting lighting solutions. Mirrors and metallic accents naturally bounce light back out into a room, making the room itself appear lighter, brighter and bigger overall. Hunt down lamps, ornaments and other accessories with metallic details in order to create a glimmer of light that carries throughout the room. Similarly, a large statement mirror is a dramatic way to increase the perceived space within a room, while also adding interest and style. It’s a sure-fire way to energize your home. Cosiness is one of the best weapons against the winter blues, as feeling cosy allows us to embrace all the things we actually like about winter – as in, having an excuse to wrap up warm and hibernate in our homes. So now is the ideal time to invest in some homely soft furnishings to truly make your home feel welcoming. Think cushions, rugs, throws and soft bedding. 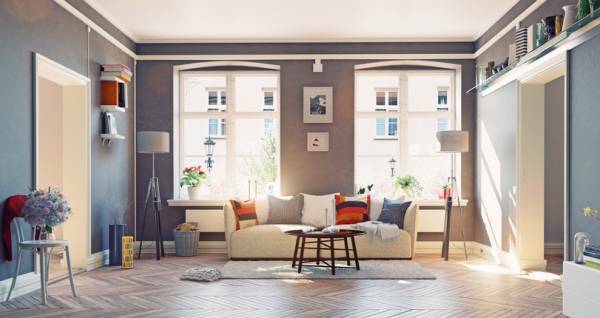 These simple, affordable and comfortable additions also provide an opportunity to bring bright and bold colours into your home, helping to liven up the space. One of the simplest and most dynamic ways to inject warmth into a neutral setting is to introduce a hot colour. This will instantly transform the energy in the space and combat any feelings of drabness or coldness. Find one or two uplifting colours to scatter throughout your interior setting, and don’t be afraid to opt for truly bold tones like zesty lime, hot pink or canary yellow. When used in moderation, these colours can be both invigorating and rejuvenating. Just be sure to stick to a couple of hues in any one space, as using more than three colours within close proximity can dilute the effect each colour has. You can even choose a single colour and paint a bold feature wall as a way to really make your home stand out. A fresh coat of paint isn’t the only way you can use tone and colour to heat things up in your home this winter. The tone of wood visible in your home can also play a huge role in determining how cosy and inviting your interior setting feels. While light wood tones and even black woods possess a cool, sleek quality, staining your woods with sunnier notes can add a richness which is reminiscent of rustic country chic styles. Tones like beech, cherry, mahogany and walnut may be very different, but they all bring a fiery base that will help to liven things up no matter your interior tastes. While paint jobs and wood stains are pretty permanent ways to warm up your home, finding the right decorative accessories gives you the freedom to swap them out as your tastes and the seasons change. This is the beauty of placing a piece of statement wall art on an otherwise neutral wall. A bright and colourful piece of art is a fantastic way to bring both energy and character to a room, adding a feel-good sense of fun while also creating an interesting talking point. You can even create a collage using several pieces you like, turning your home into your own private gallery. Or try hanging some of your little ones’ finest artistic creations so your décor always brings you joy. When we think of spring, we think of flowers. Spring is the season of blossoming and blooming, and that’s exactly what your home should do. The backend of winter is the perfect time to invest in some stunning floral wallpapers to really help bring your interior design to life with flower power. Floral prints look magical on a feature wall, or you can go for a subtler look with floral-printed cushions and curtains. Let these prints inspire the rest of your décor by picking one or two colours from within it and spreading them throughout the space. You’ll be instantly cheered whenever you step into the room. Bright colours don’t have to take centre stage in order to have an uplifting effect. Sometimes a fresh coat of colourful paint can provide the perfect backdrop to the rest of your room’s décor, allowing it to shine in a cosy, springtime setting. Look for shades which fall more on the red-yellow-orange end of the colour spectrum rather than opting for blues and purples, and this will make the most of the room’s natural warmth. More subdued shades like dusky millennial pink or muted terracotta are perfect for creating that uplifting feeling without being too overpowering, meaning even smaller spaces can benefit from these tones. We often forget just how powerful lighting can be when it comes to interior design. More often than not, we think of it as something very practical, but the aesthetic power of lighting is unrivalled, and finding the right lighting can completely transform the way a space looks and feels. One way to illuminate your home in style is to invest in coloured glass fixtures. As well as lighting the space effectively, they’ll also add a touch of colour that will help distance your home from the dull weather outside. These additions work particularly well in the bedroom, where softer lighting is welcomed in order to create a more relaxing atmosphere. Arguably the most effective way to bring springtime energy into your home is also the simplest: plants and flowers. Nothing beats actual greenery when it comes to banishing the winter blues, so don’t be afraid to make up for the lack of foliage outside with some stunning floral arrangements and refreshing houseplants sprinkled throughout your home. The natural world is full of beauty, colour and variety, so there are endless options available. Let these plants inspire the rest of your décor and create your very own haven to keep you cosy, cheery as you wait for spring to arrive. Investing in your dream home at Craighouse is sure to banish the winter blues, make others green with envy and make you feel tickled pink. Explore more of the stunning properties available at Craighouse, located in the heart of Morningside, by clicking here.